A hard check by Arden Cohen (7) of Darien, right, dislodges the ball from attacking Greenwich player William Baugher during their game Saturday in Greenwich. GREENWICH — Trailing at the half for the first time all year, the Darien lacrosse team knew that it needed a change in mentality. After a flat first half led to a deficit at the break, the Blue Wave opened the third with three-straight goals from Logan McGovern, Blake Sommi and Finlay Collins before going on to defeat Greenwich 12-8 on the road Saturday. 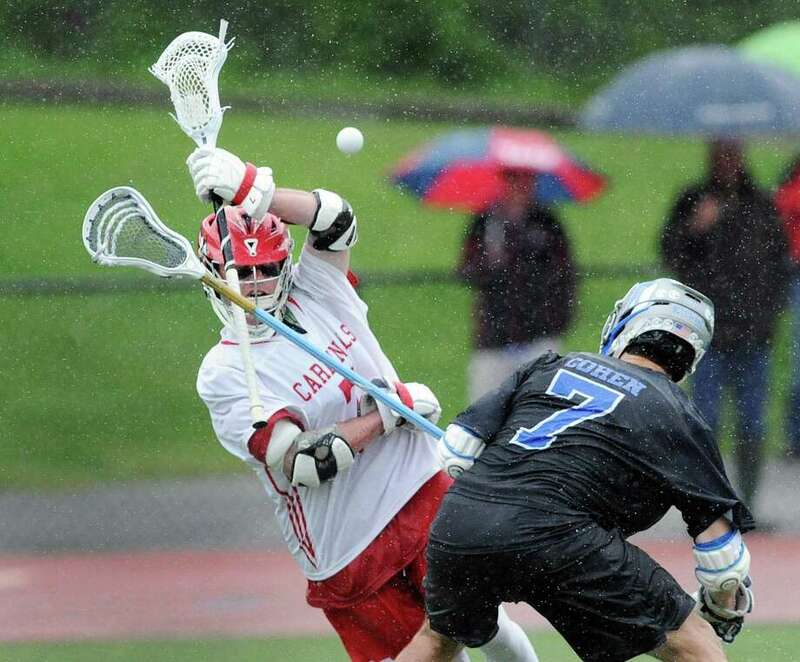 Darien — which is the top team in the country according to the Under Armour/Inside Lacrosse rankings — outscored the Cardinals 10-3 in the second half and 5-0 in the fourth quarter alone. Kevin Lindley led the way for Darien (15-0, 11-0 FCIAC) with four goals while Collins and Riley Stewart each had two. Brian Minicus and Sommi had one a piece for the Wave. Greenwich (10-5, 9-2) got off to its hot start behind the play of Feda, who had five goals in the contest. Bailey Savio was dominant at the faceoff X, winning 13 in 17 tries, and Andrew Triscari made 12 saves in the contest. “We went into it thinking that we can play well against them,” Cardinals coach Bobby Lutz said. “A lot of this comes down to not being intimidated and having the confidence to go against the best team in the country. We had a pretty good game plan, then we had a couple good practices leading up to it. Logan McGovern, Darien. The junior attack registered two goals and four assists in the contest. Darien was at its best when McGovern was able to orchestrate the offense from behind the net. It’s been almost two years to the day since Darien last loss. That came 46 games ago against none other than Greenwich back in 2015 after a 12-11 overtime win by the Cardinals. Midway through the contest, Darien coach Jeff Brameier was having flashbacks. During Saturday’s contest, each Greenwich player wore t-shirts showing support for veterans. At halftime, the captains presented the James J. Peters VA Medical Center, located in the Bronx, with a donation from the Cardinal Lacrosse Booster Fund. Cardinal players have spent several Saturdays this season volunteering at the VA hospital and invited the veterans to Saturday’s game. Records: Darien 15-0, 11-0 FCIAC; Greenwich 10-5, 9-2. Scoring: D—Logan McGovern 2 goals 4 assists, Kevin Lindley 4g 1a, Finlay Collins 2g, Riley Stewart 2g 1a, Brian Minicus 1g, Blake Sommi 1g; G— Jack Feda 5g, Jack O’Connor 2g, Matt Baugher 1g, Addison Muir 2a. Goalies: D—Ryan Cornell (9 saves); G— Andrew Triscari (12). D—21; G—14.